indcsn are about to hit the three year mark in their youthful but illustrious career so far and to celebrate they’re offering a nice 40% off for their supporters. It’s hard to believe that it’s been almost three years already since we first featured indcsn back in June 2010, but time flies and things move forward. indcsn are one of the few UK start-up brands that we’ve featured over the years that have continued to grow and establish firm roots – there have been plenty of brands pass through our pages, but only a select few make it to this point, so congratulations to all the indcsn family for that alone. Three years in, indcsn recently dropped one of their best presented lookbooks for Spring/Summer 2013 and we look forward to continuing to watch this brand grown and flourish from season to season. 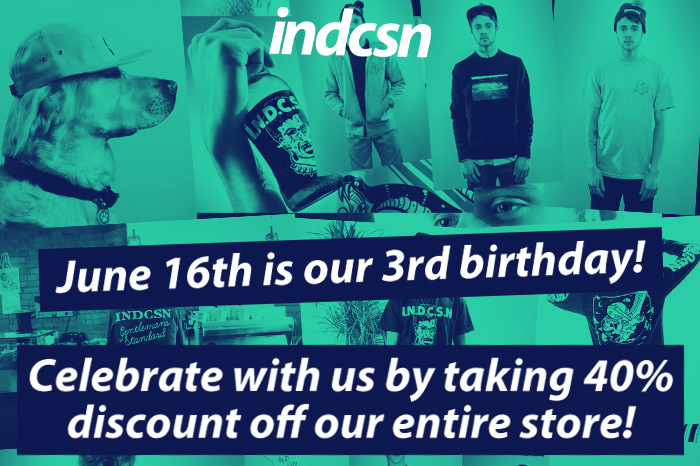 Hit up the indcsn webstore and enter the code birthday40 to claim your 40% birthday discount on any products. Happy birthday for the 16th indcsn!